UKARIA Cultural Centre is perched on the hillside of the Ngeringa property in the picturesque Adelaide Hills just outside Mount Barker. The Centre is located just 40km from the Adelaide CBD and is an easy drive on the South Eastern Freeway, which takes 40 minutes. Getting to UKARIA is now even easier via the new Bald Hills Road exit, which bypasses the township of Mount Barker and takes you straight to UKARIA's tranquil setting, surrounded by rolling hills and vineyards. UKARIA Cultural Centre is 1km from the junction of Williams Road. Please drive slowly as Williams Road is unsealed. We recommend arriving at least 30 minutes before the scheduled start time of a performance. The gates to the Cultural Centre open 90 minutes before each event, and doors to the concert hall generally open 30 minutes prior to the commencement of a performance. What are the transport options to the UKARIA Cultural Centre? Travelling by car is currently the most convenient option. 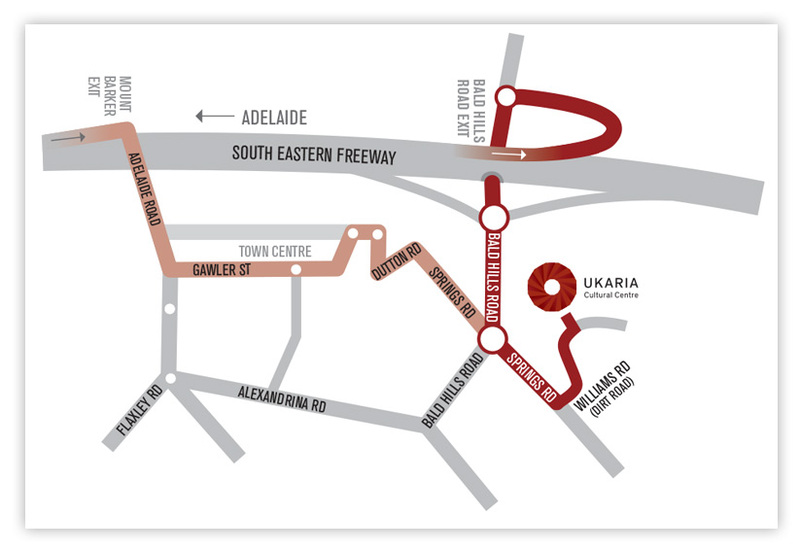 The UKARIA Cultural Centre is located just 40kms from the Adelaide CBD and is an easy drive on the South Eastern Freeway, which takes 40 minutes. Take the Nairne/Bald Hills Road exit (after the Mount Barker exit). UKARIA Cultural Centre is 1km from the junction of Williams Road. Please drive slowly as Williams Road is unsealed. Once you enter the car park, please observe the 20kph speed limit. Visitors may find ride-sharing service Uber appropriate for their touring needs. Download the Uber app from the Apple App Store or Google Play. There are regular bus services from the Adelaide CBD to Mount Barker, from where you can get then get a taxi or Uber to the UKARIA Cultural Centre. For more information on public transport services, call Adelaide Metro on 1300 311 108, or download the metroMATE app, or visit www.adelaidemetro.com.au. You can access the Mount Barker bus timetable here. Yes. There is ample parking on site and multiple entry points from the car park through the garden to the building on paved paths. Are there disabled parking bays? Yes. There are multiple disabled parking bays at the top right of the Cultural Centre. Head straight up the driveway on your right hand side, where you will see ‘Disabled Parking’ signs near the alfresco. Yes. Please see a member of our Front of House team in the foyer before the performance and we will make sure to accommodate you. You can also let us know in advance by contacting us on (08) 8227 1277 or by email at info@ukaria.com. Yes. Our alfresco bar is open 90 minutes before each event. Enjoy a glass of wine or barista coffee before a concert or during the interval. UKARIA’s wine list celebrates one of Australia’s largest and most diverse geographical wine regions – the Adelaide Hills – known for its approachable, vibrant, cool climate wines. Our list offers a diverse array of intriguing and affordable wines from smaller producers, offering a very special expression of the region’s distinctive terroir. You can view the full list here. Please note: bar opening hours may differ for events presented at UKARIA by other organisations. Can I purchase meals at the Cultural Centre? No. For evening concerts presented by UKARIA, cheese platters are available for $20, along with a range of sweet and savoury snacks. For some events presented by UKARIA, e.g. UKARIA 24 and our dusk series The Magic Hour, sit down meals are available. These are separately ticketed events and can be booked on our website (unless sold out). Smart casual attire is generally the most appropriate, however UKARIA does not have a dress code. How many seats are there in the venue? 220. The UKARIA Cultural Centre was purposely designed for chamber music. Please note: some events may have less capacity, e.g. for large ensembles that require more space on the stage floor. Can I take food and drink inside the concert hall? No. Unless otherwise stated, food and drink may only be consumed in the alfresco, foyer or garden. Can I take photos or videos during the event? Artists are entitled to their privacy and may not wish to be photographed or filmed. Please check with our Front of House team when you arrive. As a general rule however, no flash photography is permitted, and if using a single lens reflex camera, we ask that photographs only be taken during applause to minimise noise disturbance to the artist(s) and other audience members. Yes. The UKARIA Cultural Centre has free Wi-Fi for guests. Please ask a staff member for the password if you require access. I'm travelling from interstate. Where can I stay nearby? Nestled in the Adelaide Hills is the magnificent biodynamic Jurlique Farm where many of the herbs, flowers and plants are grown for natural skin care products. Join a Jurlique Farm Tour for a unique opportunity to learn about this much-loved Australian brand and visit the home of Jurlique Australia. Discover 26 large stone sculptures by internationally renowned artists dotted along a trail through the rural landscape, towns and villages of the Adelaide Hills and beyond to the Fleurieu Peninsula. All are easily accessible in public places. The Cedars is a unique 60 hectare heritage property on Heysen Road – the historic home of one Australia’s most noted landscape artists, Sir Hans Heysen. Hahndorf is a contemporary village just half an hour from Adelaide, proud of its German heritage still visible in its traditional streetscape. Stroll the tree-lined main street and visit shops, galleries and studios, a cheese maker, leather smith, candle makers, craft brewery, chocolatier, restaurants, German pubs and cafés. Situated in the centre of the picturesque village of Hahndorf in the Adelaide Hills, the Hahndorf Academy is a place where visual arts and heritage meet. Pick your own strawberries at the Beerenberg Family Farm from November to April in Hahndorf. The National Motor Museum holds Australia’s biggest motoring collection. For more ideas, download a copy of the Adelaide Hills Visitor Guide here, or visit adelaidehills.org.au. Can I visit UKARIA outside of event hours? The UKARIA Cultural Centre is generally not open to the public outside of event hours. However, it may be possible to schedule a visit by appointment. For access outside of concert hours, please contact (08) 8391 0986 or email info@ukaria.com. I can't attend a concert I booked tickets for. Can I get a refund? Your ticket is transferable and can be given to friends or family if you are unable to attend. We do not offer ticket refunds but if we have capacity you can swap your ticket to an event of equal value within the same calendar year by contacting UKARIA at info@ukaria.com or calling (08) 8227 1277 during office hours. Do I qualify for concession? Concessions are available for students, pensioners and health care cardholders, including seniors’ health care cardholders. I have a UKARIA Gift Voucher. Can I use it for events presented by other organisations? No. Events presented by other organisations, such as Adelaide Festival, Recitals Australia, and Adelaide Baroque, have independent ticketing systems that are not managed by UKARIA. UKARIA Gift Vouchers are redeemable for all events presented by UKARIA, and can be used as part payment. Vouchers are also valid over the bar. You can present it on the day, or pre-order wine by the glass, and/or a cheese platter. You can phone our office on (08) 8227 1277 during office hours, or email info@ukaria.com. If you have queries on the day of a performance, please phone the Cultural Centre direct on (08) 8391 0986.